As an apology to you, my dear readership, for my almost 6-month absence from blogging, I bring you something that will most certainly cause you to heap forgiveness on me without a second thought. I’m diving right in because while I do have much to tell you and many words in which to say those things, it’s also a bit of a crazy day. That’s just how much I love you. No beating around the bush! I love the breakfast sandwich. When you think about it, it’s what breakfast is all about. Some brilliant chef somewhere (or perhaps someone with the munchies who was brilliant enough to do some experimentation) took the four most common breakfast elements in American culture – protein (or fat-laden meat with lean strips of protein), eggs, dairy, and carbohydrates – and slapped them all together in a glorious chorus of flavor and melted cheese. While not for the calorie-conscious, a breakfast sandwich has the brilliant versatility of allowing for endless combinations of tastes and personal preferences while also being portable and filling. You can make them healthier by substituting egg whites for egg or low-fat turkey bacon for sausage. Today, of course, I didn’t do either of those things, but the possibilities are there. To begin, my dear hubby and I took a quick jaunt over to our local grocery store – one of those places that has what you need when you need it at low, low prices. We picked up all of our main players – bagels, one pound of ground pork, locally-sourced eggs and cheese. 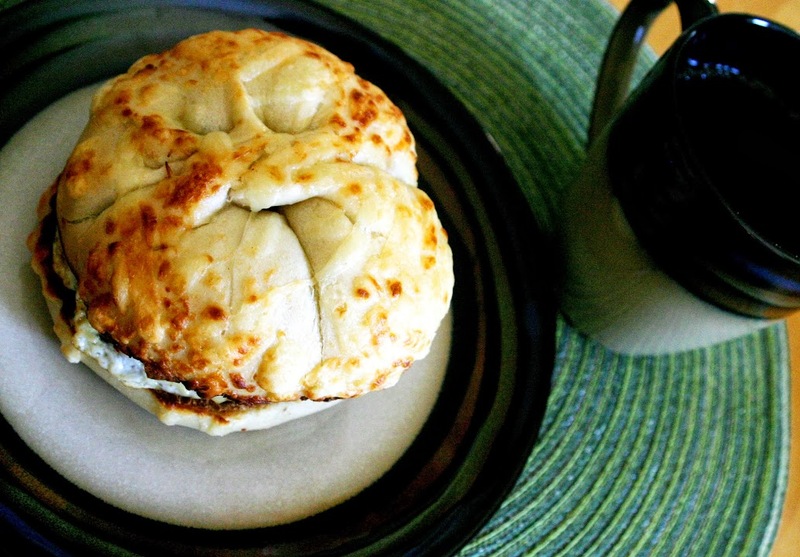 For this specific recipe, we found some excellent asiago cheese bagels to serve as our carrier for the rest of the sandwich. Why asiago? 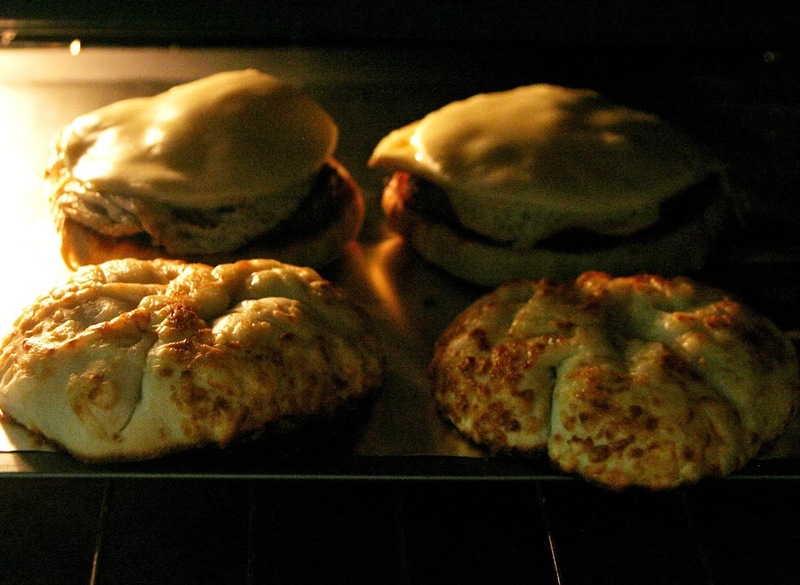 They’re hefty, soft bagels with that tangy cheese baked right on top. They also provide a lovely complimenting contrast to our choice of sweet sausage. For our cheese, we went with basic smoked provolone – nothing fancy, mostly because of our small selection (and small budget). After slicing our bagels in half, we put everything else aside to focus on the wonderful and satisfying joy of mixing up our own sausage. 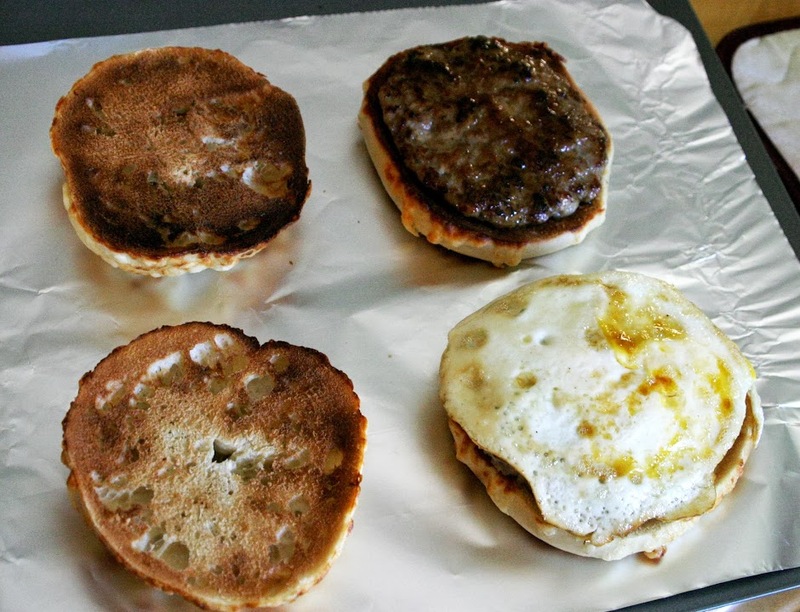 The best part about making your own is not only the cost – compared to buying some preservative-filled, overly-priced box of Jimmy Dean or Bob Evan’s patties, you can save a good chunk of change and personalize the recipe to your tastes or to the specific type of breakfast you have in mind. Maple syrup is one of our passions here at the Steinway, so I decided on a basic maple sausage recipe. Put your one pound of delicious pork meats into a bowl. Then, I added two tablespoons of maple syrup. Don’t get me started on that fake-o pancake goop. It’s GOT to be the real deal! NO FAKERS HERE! They’re not even TRYING to be vaguely maple-flavored! PAH! PAH I SAY! Rant concluded. I then added almost a teaspoon of ground sage, a teaspoon and a half of salt (more or less to taste), a teaspoon of granulated garlic and a teaspoon of granulated onion, about a tablespoon of brown sugar (for a little extra glaze), and a few dashes of black pepper. I occasionally will add a little crushed red pepper for heat, but not today. If you like spicy, make it spicy! After adding all your seasonings, it’s time to mix it all into a glorious mash of meat and spice. You can mix with a spoon if you wish, but if you really want to blend it up and get down and dirty, do what I do and get your hands in there and squish and mash until thoroughly combined and ready for shaping. If you’re wondering how to tell if your sausage is seasoned to your liking, put your skillet on the stove over medium heat and fry up a small piece. That’s really the best way. Otherwise, you can just cook them up and tweak them for the next time. It’s a learning process. 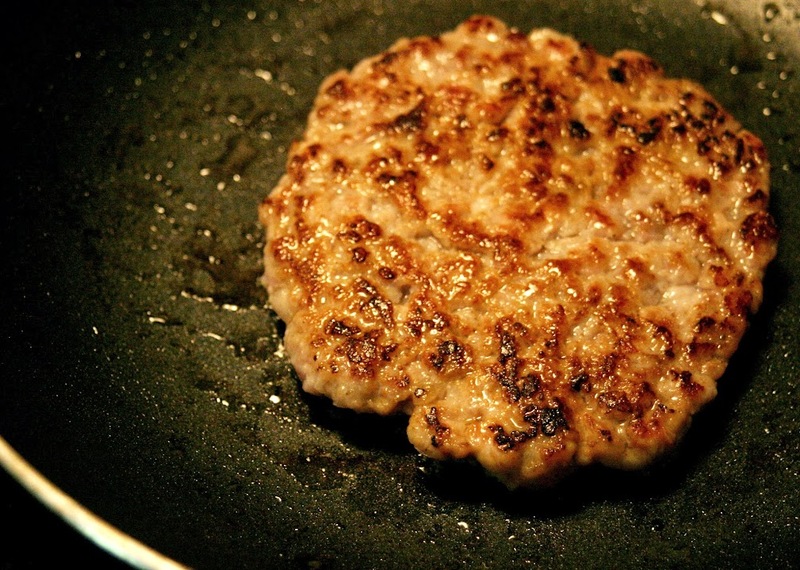 Once mixed, make about four-4 oz balls of meat (about the size of a billiard ball) and flatten them into patties. It may take a little shaping to get them to look beautiful and disk-like, but they’ll get there. Make sure they’re relatively thin. Glorious pork, aglow with sunlight! 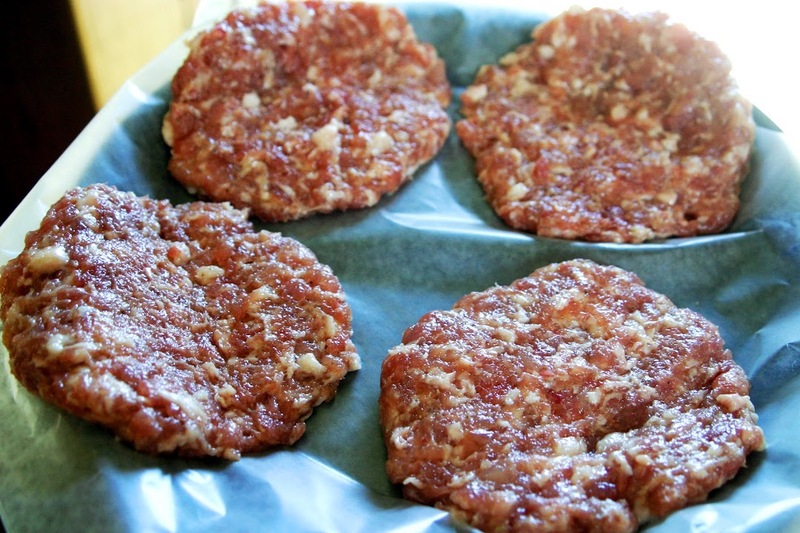 Since DH and I were the only ones eating this morning, we decided to freeze the extra patties for a later time – just layer them in wax paper and stick them in a freezer bag. To defrost, either leave in the fridge overnight or defrost in the microwave before frying up the next morning. Now that our meat is prepared, we wash up and get ready for the whole ensemble to come together! Start by giving your bagels a little pre-toast. You can do this in a toaster if you wish, but lacking a toaster big enough, I chose to use my oven broiler on low. 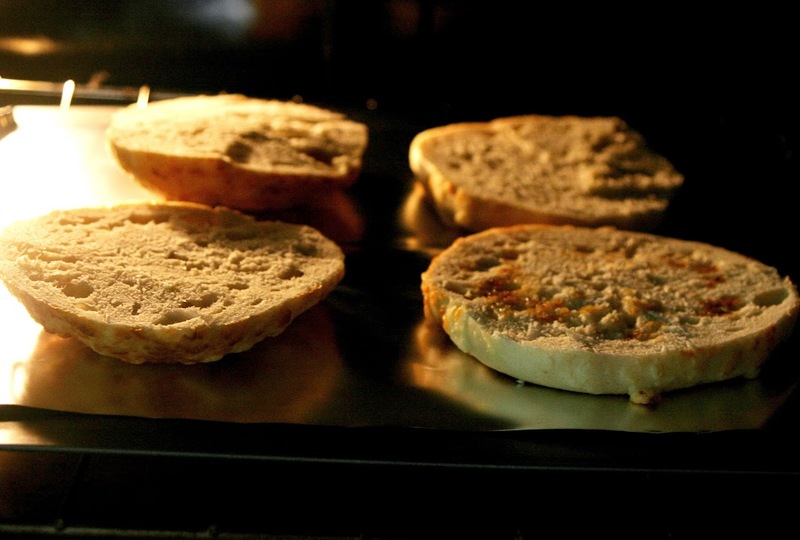 Keep the door cracked open an a careful eye – they can go from delightfully light golden brown to burnt in seconds. One advantage to doing this method is the bagels are ready to go on a cookie sheet for when your sandwiches are ready for assembly. With bagels toasting, start preheating two skillets for the eggs and sausage. For the eggs, throw about a tablespoon of butter (more or less to your liking) in the pan and let it start to melt and get a little bubbly. For the sausage (especially when using non-stick cookware), no grease needed. The little guys will produce enough fat of their own. Put the heat to medium for both pans. In the meantime, take out your bagels and set them aside. Ours were a little more well done than I wanted, but still delicious and ready to be layered with morning joy. Now your pans should be ready to rock – for the sausage, cook for about 3-4 minutes on each side or until brown, sizzling and reaching an internal temperature of about 160 degrees Fahrenheit. I love using my cooking thermometer because so many recipes call for checking to see if the meat is still pink – who wants to tear about their lovely sausage to see if it’s done? Once cooked, just set aside on a small plate lined with paper towels and let it rest. Brown, delicious and maple glazed. Now, onto the eggs – my DH was my sous-chef and helped me on this part to make the time go faster. Fried eggs are a new chefs best friend. 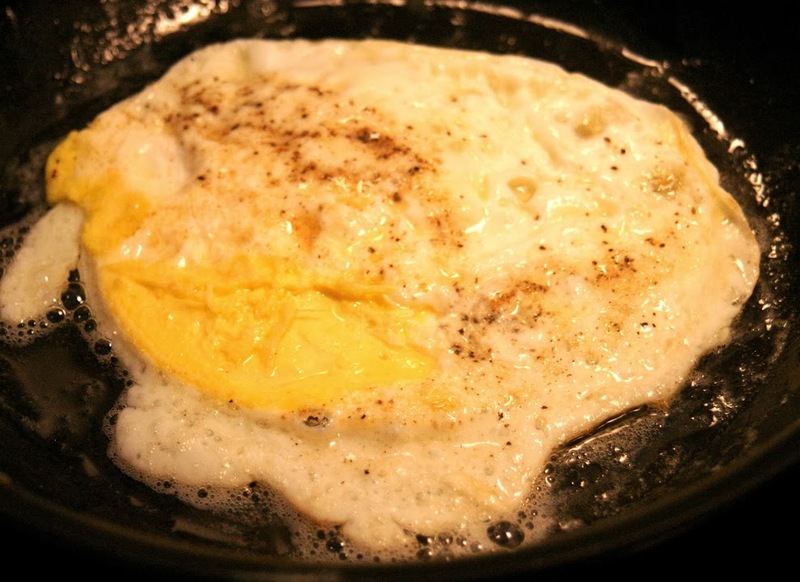 Easier than scrambled in many ways, all you have to do is crack them into the skillet (trying not to break the yolk, but in the end, it all tastes the same) once it’s heated and let them sizzle away. Sprinkle them with salt and pepper, or a little seasoning mix like Penzey’s Mural of Flavor, and occasionally spoon some of the melted butter in the pan over the yolk. When the egg white has all turned opaque and the yolk starts to set, carefully flip the egg with a spatula and cook on the other side, again sprinkling with a little seasoning. The egg is done when the yolk is cooked to your liking and the white has a little bit of brown along the edges – not too well done, just right. As your eggs finish up, go ahead and put the sausage on the bottom part of the bagel. As each egg is through cooking, you can move them right from the pan to on top of the sausage. As it all comes together…. 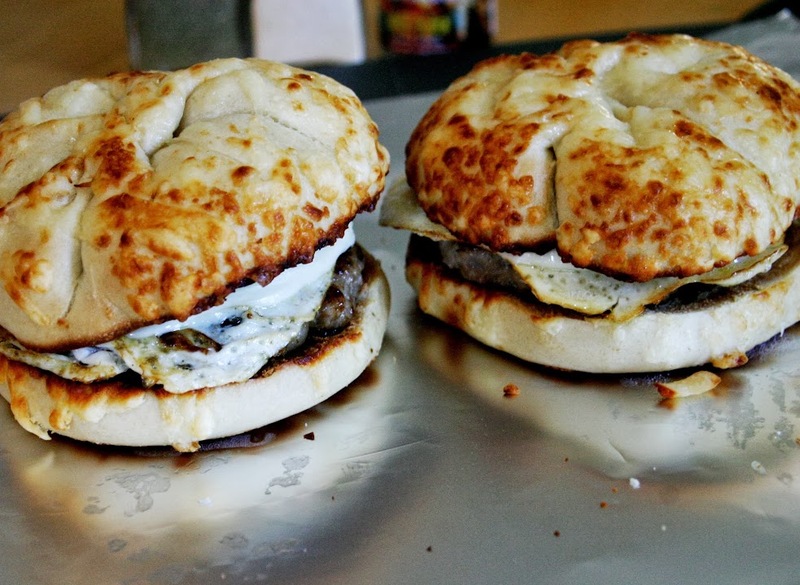 Once both bagels have sausage and egg, lay your cheese on top and put everything under the broiler on low until your cheese gets melted and starts to bubble. Again, keep a close eye. The last thing you want is overdone cheese. I also flipped the bagels over so the asiago topping could get warmed up and reheated. Good decisions on my part! Add that all up, and for two of us can have a hefty breakfast sandwich each for $1.59 – $3.18 spent altogether on breakfast. How cool is that? Best part is that we now have all the components in the house so we can make them anytime – and these were so filling, we both had some leftover that we saved for this morning. I love cooking, I love saving money, and I love sharing my passion with my friends! I hope this little sidetrack into the Steinway kitchen has thoroughly made up for my blogging laziness over these past few months. Happy cooking, and enjoy your good eats! – Be creative! 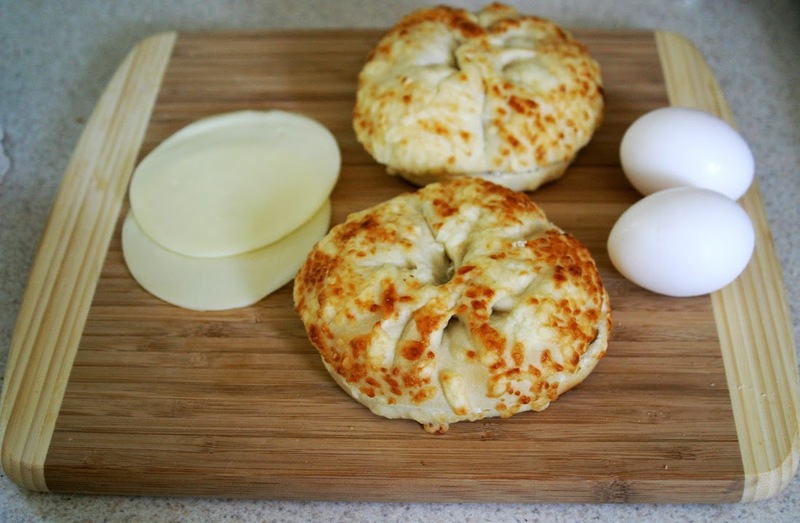 Instead of asiago, use onion, everything, or plain bagels. If feeling a little soft, use kaiser rolls, english muffins or just some good hearty artisan bread! 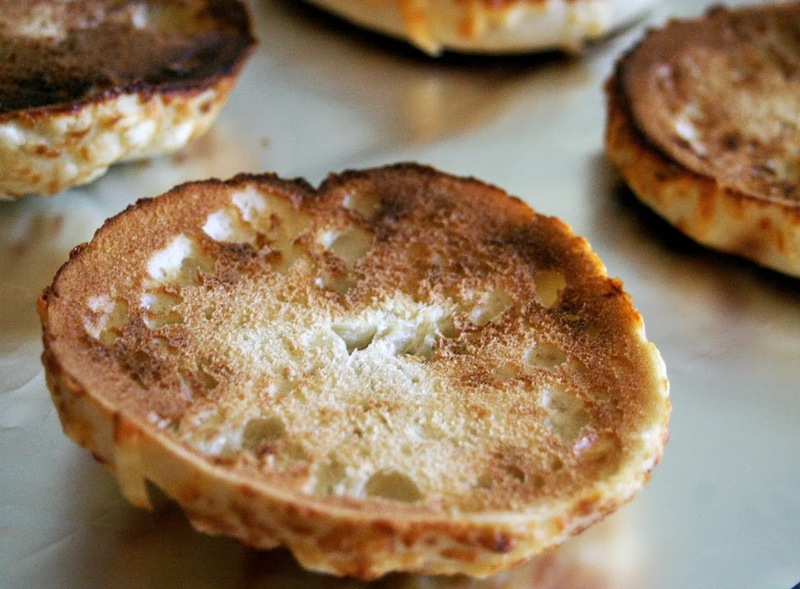 For any of the non-bagel options, consider spreading with a light layer of butter and toasting in a skillet. 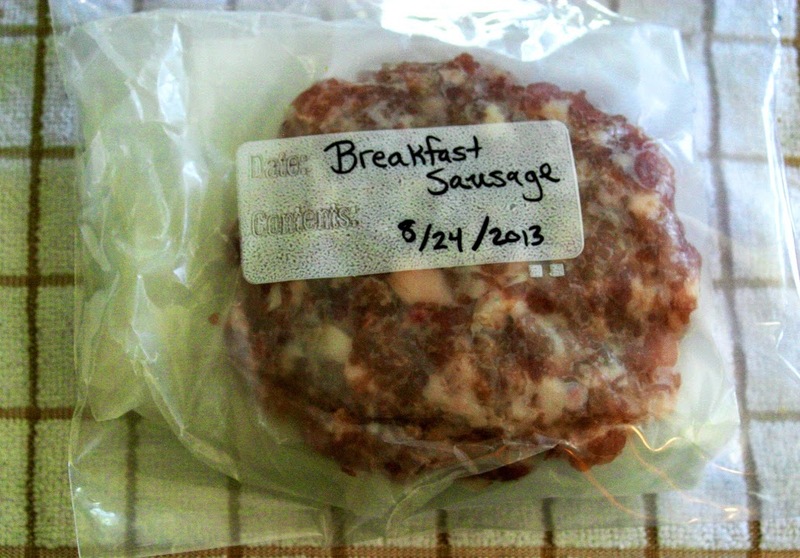 – Feel free to purchase any of your pre-made sausage favorites in a pinch! I love the satisfaction of making my own, but I also appreciate convenience and reduced mess. – On a similar meat note, don’t stop at sausage! Try bacon, ham, Canadian bacon, turkey bacon, your choice! I used to make super quick breakfast sandwiches to go in college using lunch meat (usually ham), shredded cheese, a well-seasoned fried egg and normal whole grain sandwich bread. Adapt to what you’ve got! 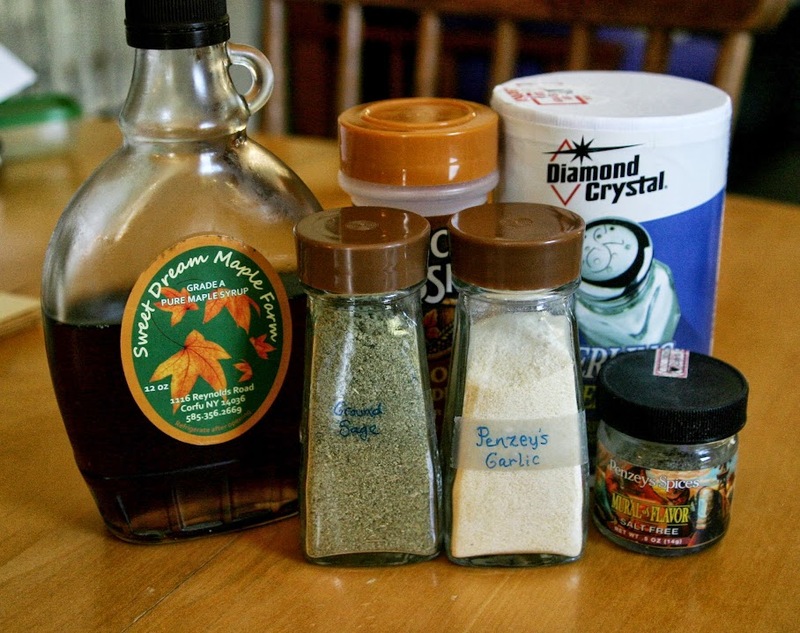 – Spices can vary immensely – if you don’t like sweet, try adding some crushed red pepper or Tabasco for a kick. Or, stick to your garden herbs and make a savory breakfast companion. Much like my beef breakfast sausage, there’s no rule as to how it should taste! In short, get creative or stick right to the recipe. Have fun, and enjoy what you eat!